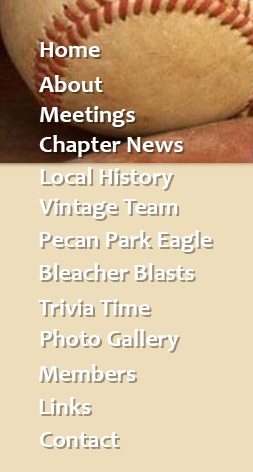 Little is known of these first venues without further research into what passed for the Elysian Fields of Houston during the early era of Houstons base ball passion. We do know that a love for the game quickly helps people find a vacant lot or field somewhere  and there were many of these in the area near present day downtown Houston well into the second half of the 19th century. We also know from newspaper reports that teams from Houston and Galveston traveled several miles to the far east of downtown to play each other on the hallowed land that we still protect as the San Jacinto Battleground. As reported earlier, the Houston Stonewalls defeated the Galveston Robert E. Lees in that one by a whopping margin of 35-2. More research is needed in this early era. 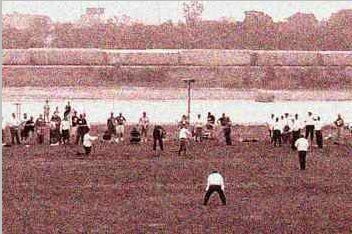 March 6, 1888: When the daunting Houston Babies took on the Cincinnati Red Stockings in the first professional game played in Houston by a team bearing our citys identity, the 22-3 routing by the Reds of our local charmers took place at a downtown site known aptly as the Houston Base Ball Park. Unfortunately, the newspaper writers of that day made no reference to the base ball parks precise location. They simply presumed that their readers all knew where the place was located.  They werent writing for readers from the 21st century  but unfortunately for us, they are pretty much all we have to go on as a written record of past events that werent otherwise covered in books for posterity  and the first professional game of base ball played in Houston never rated that high degree of written attention. Earned Runs: Cincinnati 8, Houston 3. Bases on Balls: Cincinnati 4, Houston 2. Strike Outs By: Flood 7, Serad 5. Left On Base: Cincinnati 7, Houston 4. 2BH: McThee (2), Kappel, Serad, Dauthett, Horan. Passed Balls: Lohbeck 6, Keenan 1. Stolen Bases: Howard, Dauthett, Craig (1 each), Cincinnati 8. Time of Game: 1 Hour & 45 minutes. Again, more research is needed of the agate-type newspaper files on microfilm of the late 1880s, 1890s, and first decade of the 20th century. From my readings, I have a hunch that the Houston Base Ball Park was laid out on the same site that later housed a more famous home of Houston baseball  a place called West End Park. We wont stop on hunches, however. We must keep on looking until we find the evidence that rests somewhere in those hard-to-read files at the library. I have not performed a search for  and then a search of  old street and business directories from the 19th century, but I plan to do so. When Houston returned to the Texas League in 1907, they moved into West End Park at 601 Andrews Street off Smith in downtown Houston. The old ballpark site is now covered by the Allen Center, but no plaque exists to mark its location as the first real baseball stadium in Houston and the probable site of its first 1888 professional game. 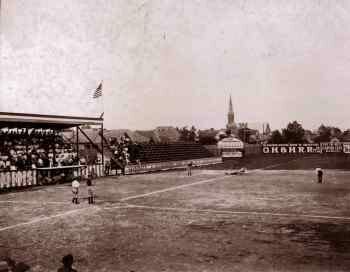 As a ballpark, West End Park seated about 2,000 people in wooden stands. For its time, it got the job done as a practical home of the Houston Buffs. The address of the ballpark has been confirmed from old city directories, as has the name, West End Park. The venue was never known as West Side Park or West Side Grounds, as is sometimes reported by those who confuse those identities of old Chicago venues with the place that was ours in Houston. In spite of what some may think, getting the right name down on historical places does matter. The first real home of the Texas Leas Leagues Houston Buffs was West End Park. The first baseball park (used by the Houston Monarch/Black Buffs) was known as the East End Park located in the 3300 block of Cline St. within the fifth ward. 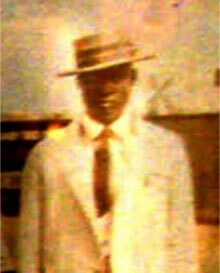 The time reference is early 1920 to 1928.  Frank J. Liuzza, son and nephew of the two brothers who founded and owned the local black baseball club, 10/17/2007. The second baseball park was known as Monarch Stadium located on Gillespie St. It was in use from late 1928-1942. It was also located in the fifth ward. For your information this land was purchased from Mr. & Mrs. Clark Gable, yes it is the movie star. At this stadium there was a concession stand, estimated seating capacity of 1,500 fans, & a clubhouse. The clubhouse was the first ballpark for minorities to have showers and sanitary facilities. Also the Liuzza brothers provided access to Monarch stadium to Wheatley High School for their football team and band practices. Admission was 10 cents. The team began its existence as the Houston Monarchs and at some period later they became the Houston Black Buffalos. In l939 James J. Liuzza traveled to Canada with the Houston Black Buffalos. Pat Johnson Ford Company loaned them cars for the trip. Upon their return the cars were displayed in the window advertising their intercontinental trip to Canada and were for sale.  Frank J. Liuzza, 10/17//2007. 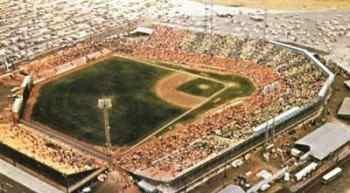 Buffalo Stadium opened as the home of the same season Texas League Champion Houston Buffaloes. Even with a name change to Busch Stadium in 1953, this shiny new concrete and steel, 11,000 seat ballpark that opened in 1928 would remain the home of the Houston Buffs through the 1961 season. Cardinals General Manager Branch Rickey and Baseball Commissioner Kenesaw Mountain Landis both attended that first opening game of April 11, 1928 as the Houston Buffaloes took a Texas League season opener from the Waco Cubs, 7-5. Commissioner Landis described Buff Stadium as the finest new minor league ballpark in America upon the occasion of his 1928 visit to Houston. Located about four miles east of downtown, the new park was easily reachable by street car and, irony of ironies, the present site of Minute Maid Park at Union Station was one of the main places that the fans of 1928 caught the street car to go to the ballgames at Buff Stadium. Buff Stadium was located on the same grounds that until recently housed the Finger Furniture Company on the Gulf Freeway at Cullen Boulevard. April 11, 1928 also marked the birth of the electronic sports media era in Houston when Bruce Layer of station KPRC broadcast the first Buffs baseball game over the AM radio airwaves of Houston. In 1951, Buff Stadium acquired some notoriety when a depressed fan worked his way on camera and committed suicide by pistol on television. Finger Furniture memorialized Buff Stadium after its 1963 demolition by building into their then new furniture store location a museum to honor, first baseball, and then all Houston sports. The exact location of home plate was marked as the anchor point of the museum. Colt Stadium was always the working model for the word temporary. Built as an interim venue for two million dollars in 1961-62, the ballpark held 32,601 fans when it opened on April 10, 1962. By the time it closed in 1964, seating capacity had increased to 33,010, but that was of little matter. The place wasnt built to last as either a permanent home to the new Houston National League club or as any great monument to ballpark architecture. Colt Stadium was built so that Houston fans could watch the nearby ongoing and massive construction of the worlds first multi-purpose domed and air conditioned stadium. Fans could see it all unfolding across the same steaming parking lot from their uncovered seats at Colt Stadium, located some one thousand feet or so away. Some of us early fans who came to Colt Stadium in 1962 had another name for it, one that fell just short of hell. With temperatures soaring over 100 degrees and searing sunrays baking directly down upon you for day games, and organized eating squad mosquitoes controlling the skies at night, we called it the griddle. It didnt matter how few clothes you wore for day games, you always left there three hours later feeling and smelling just like a stinking pancake. It didnt matter either how much you wore in the evening, the insect vampires still found their way to your bloodstream. I was there for the Saturday day game that led to Sunday Night Baseball in the way we described earlier. Fifteen fans were taken to the hospital that afternoon with heat stroke or other sun exposure issues. A house is not a home without a roof and air conditioning in Houston, Texas  and Colt Stadium had neither. After the Dome opened in 1965, Colt Stadium was given several years to simply stand and rot away on its own. When they finally took it down in the 1970s, the grandstands were sold and moved to Gomez Palacio in Mexico where they may still be in use as home to a Mexican League baseball team. 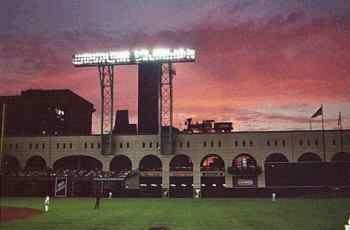 I dont recall anyone ever pausing a second to observe, recall, or memorialize the departure of Houstons first big league ballpark. The Astros did attempt to commemorate the place by leaving home plate in tact in its original spot. They placed a plaque there to tell people that they were passing over the part of the parking lot that once served as the ground for Colt Stadium. When Houstons major league club moved indoors in 1965, the theme of our efforts moved radically, if only partially away from the wild west of the Colt .45s. By the late-in-the-day time that Roy Hofheinz came up with the Astros/Astrodome space theme as an effective new marketing plan that would also extricate the club from copyright infringement problems with the Colt .45 Gun Company, people were ready to accept just about anything The Judge told them about this awesome new adventure in cool, indoor baseball. Hofheinzs introduction of the new Harris County Domed Stadium as the Astrodome  the eighth wonder of the world has always reminded me of that almost-blood-kin scene from the movie, King Kong, when adventurer/entrepreneur Carl Denham introduces Kong for the first time on the stage of a New York theatre. Ladies and gentlemen, Denham cries aloud, I give you Kong  the eighth wonder of the world! Judge Hofheinz could have played the part in a King Kong remake. He was Carl Denham from the inside out. Things didnt go quite as badly for Judge Hofheinz and the Astrodome as they did for Carl Denham and King Kong, but the new first-of-its-kind ballpark did present some now well-known but then unexpected problems whose solutions altered the game, and all sports, forever. You know the route were taking here: Because of the roof glare, outfielders were losing sight of high fly balls in the roof girders. They painted the ceiling tiles to get rid of the glare, but that move blocked the daylight and killed the grass. They then painted the grass green to get through the 1965 season. After which, Hofheinz found that Monsanto Chemical had produced an artificial turf for welcome mats and small patio lawns that could be produced in larger sections to cover the playing field of the Astrodome. Houstons iconic writer Mickey Herskowitz offered the best observation on this process one day as he arrived in time to watch the new infield being zipped together. Now Houston has the only infield in the big leagues that contains its own, built-in, infield fly, Herskowitz mused. He also described the exterior of the Astrodome as looking like a giant deodorant stick that had been buried upright in the ground. 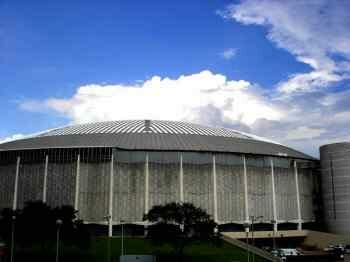 The Astrodome not only wholly changed the way all sports teams thought about their own future venue needs. It also was directly responsible for creating a demand for new turf options to natural grass. Carry it further  and the Astrodome influence was seen in the creation of all those tasteless cookie-cutter, multi-purpose stadia that we have since torn down in favor of retro parks that ooze character and serve baseball alone. Ironically, the Astrodome still stands, rotting away without an affordable, supportable purpose, but with a place in history that will never be erased. So far, no political body has had the guts or heart to make the other call of putting her out of her 2009 misery by way of the wrecking ball. When we consider the millions we are spending in public money, just to do nothing but maintain the old structure in its present form, we may also be looking at the most expensive case of public procrastination in local history. When the new downtown ballpark first opened in 2000 as Enron Field at Union Station, it seated a capacity of 42,000 fans in the comfort of a retro-designed, sliding roof structure that offered both the attractions of air conditioning or open skies, when the weather was milder. The sliding roof, of course, made it possible to again cover the field with the finest kinds of natural grass available. In 2005, its 6th total season of existence, Minute Maid Park did something that the Astrodome couldnt do in thirty-five years as home of the Houston Astros. It hosted a World Series. We didnt win, but we got there. And maybe well get back there again soon with an even greater appreciation for our long local baseball history. The great thing about SABR is the opportunity we have to be around others who care about the long history of the game. To many of us, Minute Maid Park could be a symbol of what we aim to experience through the Larry Dierker Chapter of SABR. Architecturally and programmatically, MMP connects us to baseballs past, present, and future, almost without even trying. In addition, we enjoy an excellent relationship as SABR with the Astros. We hold an annual presentation meeting at the ballpark each season on a game day that is always special. Last year we were blessed with a presentation by Hall of Famer Monte Irvin, just one of the great former ballplayers who live in the Houston area. What a magic carpet ride that day turned out to be. Mr. Irvin must have dropped fifty years off his age in that single hour talk alone. You know something else? A lot of America doesnt know how long and deep our local baseball history really is  and how broad our bedrock baseball community truly extends. The fact that the annual Houston Winter Baseball Dinner every January annually attracts from 1,100 to 1,500 people speaks volumes. Another great thing about SABR is that we never run out of topics to discuss or explore. 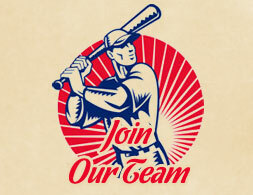 And, of course, the greatest thing about SABR is that its always about baseball  and our individually unique opportunity here to live the baseball life in any way, and to whatever extent, we choose to live it.